Murray and Suki making the most of the height in the new facility. The facility has been designed to provide choices even for the birds that don’t fly. Suki, flighted blue -front amazon on the left. Murray, non-flighted greenwing macaw on the right. I have not abandoned thee. I wanted to post an update. I know several people have heard me talk over the past year about wanting a larger place for my birds. Actually, I’ve wanted this for the past three or four years. When Suki, the blue-fronted amazon came to me last year for training, Murray, my greenwing began interacting with her to the point that it was obvious they were creating a new form of enrichment for each other. I liked what I saw it providing to Murray’s future and growth. I enjoyed having Suki around also so I knew if I wanted to keep yet another bird I needed a larger place. I don’t feel I can properly provide what five parrots need in my current household, even with the aviary. For the past several years I have been searching for a larger house with land to build indoor and outdoor flight spaces and enrichment areas for the birds. We have found one. We found a 10,000 square foot building that we can dedicate strictly to the birds. Lucky for us, there was also a house on the property. We have been working on the building and the house and we are almost to completion and couldn’t be happier. First and foremost this building is an enrichment area for the birds to run, fly, play, and scream to their heart’s content. Over the past several years I have spent much of my time traveling the United States giving presentations and workshops to the animal community. I have been saving all of my pennies to purchase this place for the birds and I thank each and every one of you for your support. I have kept my workshops in mind during the design of this new building. I plan on having several workshops at this new facility along with one-on-one or small groups of individualized training also known as A Day With The Trainer. 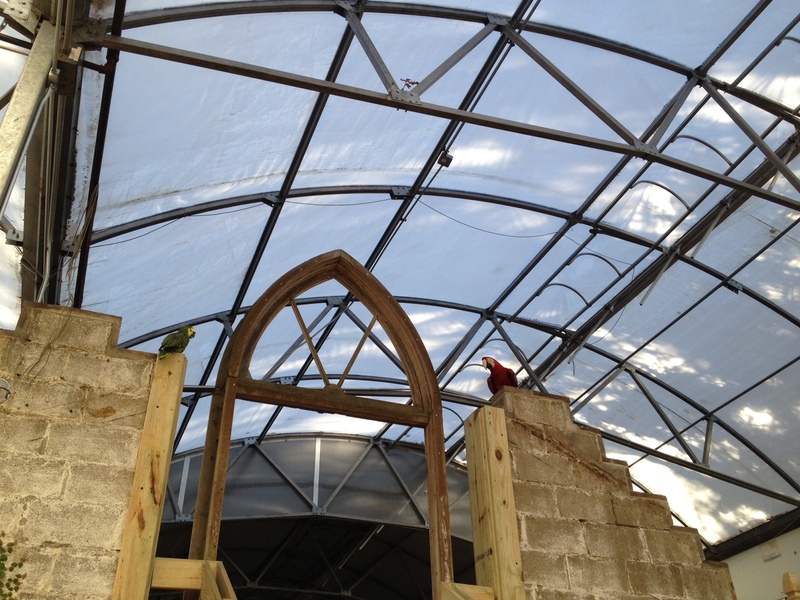 I also have designed the building for many functions that will benefit the avian and animal community. “Can you hear me now?” Rico, the umbrella cockatoo recalling to my hand from the rafters and over the arena, or pit. 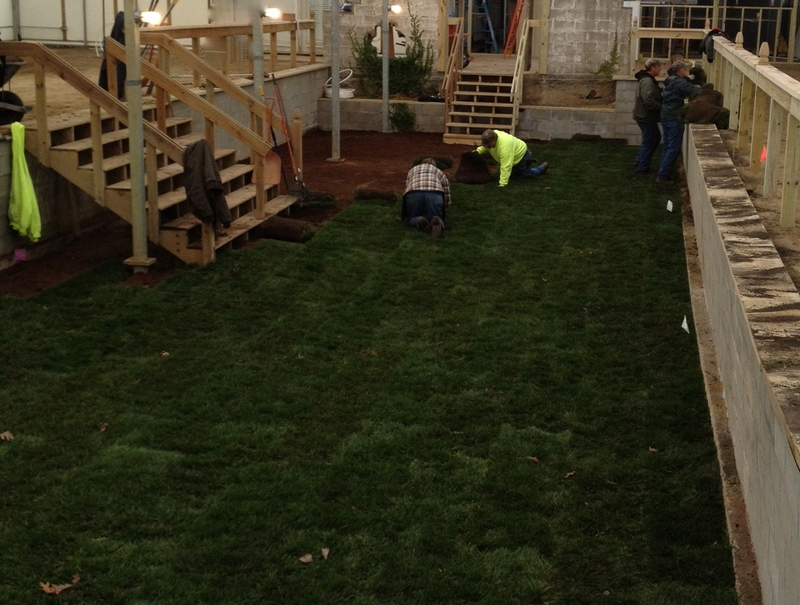 Grass being laid in the center arena. More animal enrichment being installed this winter. Yes, we will be the only ones in Ohio mowing the grass in January. individual drives into the parking lot, their avian educational experience will begin in so many ways. 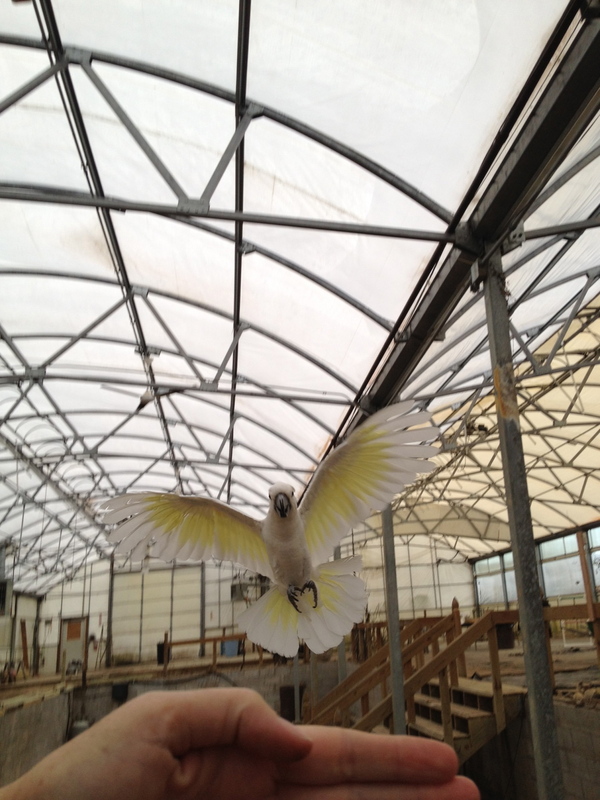 I have been introducing the birds to the facility slowly over the past month. It is a large area and I have seen it be overwhelming for the birds at times. After taking the small steps in introducing the facility to the birds they are now showing signs of being very comfortable with it. The ceilings are very tall and the center of the building has an area to walk down into a center arena or area. This height and depth has been a new concept for my birds and very interesting for me to experience with them. I am posting updates on my FaceBook page. I have been receiving a lot of e-mails and messages asking when the facility will be open, my plans for it, and bookings for workshops and A Day With The Trainer. Feel free to send me an e-mail (aviansanta@gmail.com) with questions. We hope to be moving in a few weeks and will take the time during the holiday season to share this experience and joy with our birds. This is a huge move for all of us. Thank you to everyone for your continued support and we hope to share this with you also. Happy Holidays. And to my birds, Merry Christmas with all of my heart.